Aloha Exchange Club of East Hawai'i board member Joey Estrella presents an 'Officer of the Month' plaque to Detective Derek Morimoto. 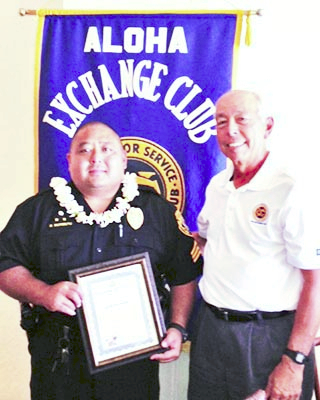 The Aloha Exchange Club of East Hawaiʻi recognized Derek Morimoto on Thursday (April 25) as “Officer of the Month” for April. 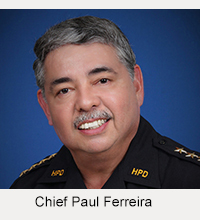 Morimoto, a detective in the Area I Criminal Investigations Section, was honored for spearheading the search for a missing 69-year-old man who was partially blind and in the early stages of dementia. Police received a report after 9 p.m. on April 13 that the man had wandered away sometime over the previous night and was discovered missing at 6 a.m. Extensive checks were conducted during the late evening of the day police learned of the missing man and into the next morning but police were unable to locate him, despite the assistance of a scent discriminating canine. During the investigation, Morimoto made contact with an area resident, who reported having seen the missing man around 8 a.m. the previous day. Morimoto and another detective scoured the area and discovered some trampled elephant grass nearby. They crawled through the thick vegetation calling out for the missing man but received no response. Along the way, they found his jacket. 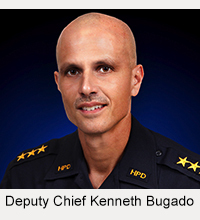 Morimoto radioed the find to another detective flying in a Fire Department helicopter and that detective spotted a motionless body in the vicinity and directed the two detectives on the ground to that location. At about 10:30 p.m., more than 28 hours after he was discovered missing, the man was found barely conscious and wearing only jeans. Fire Department personnel stabilized him and then took him to the hospital for treatment of exposure-related symptoms.